As a novelty manufacturer, Frank Edward Snyder (1853~1933) was an entrepreneur, an inventor, and a novel thinker. Widely known by his middle name, F. Edward Snyder patented a nutmeg grater in 1904, a product remaining on the market for over two decades. 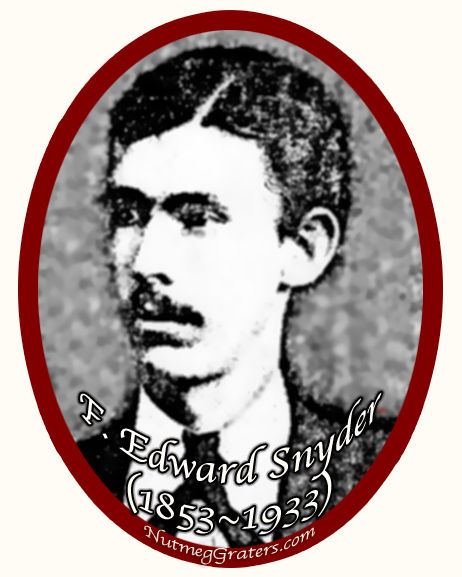 F. Edward Snyder was born in Massillon, Ohio, living there as a child until 1864 when his parents relocated to their new farm in Albion, Michigan. Following this, while in his youth, Edward periodically resided between his parent's home in Michigan and his grandmother's home in Massillon. The Snyder and Hess names of Stark County, Ohio were long intertwined ~ both as family and in metal working. Jacob F. Hess had opened a tin shop and gas~plumbing business in Massillon in 1863. In 1867, at the age of 14, Edward apprenticed for 1½ years with Hess to learn the art of tinsmithing, before advancing his career by obtaining a degree from Albion College in Michigan. Returning to J. F. Hess & Bros. in 1873, Edward resumed employment as the bookkeeper. 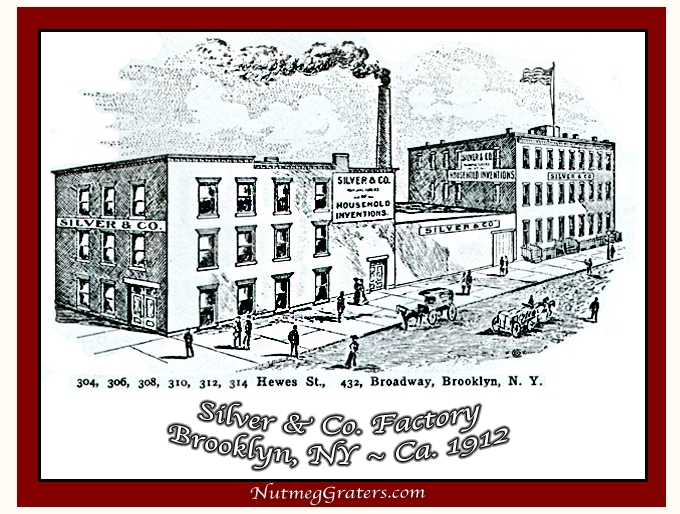 When in 1882, Jacob F. Hess & All establishes a large foundry and machines shop for "the manufacture of cooking and heating stoves, farm boilers and castings to order," the now 29 year old F. Edward Snyder partnered with David Schworm becoming the new proprietors of the tinsmithing business; renaming the business Snyder & Schworm. [SEE: 1884 & 1887 Advertisements.] 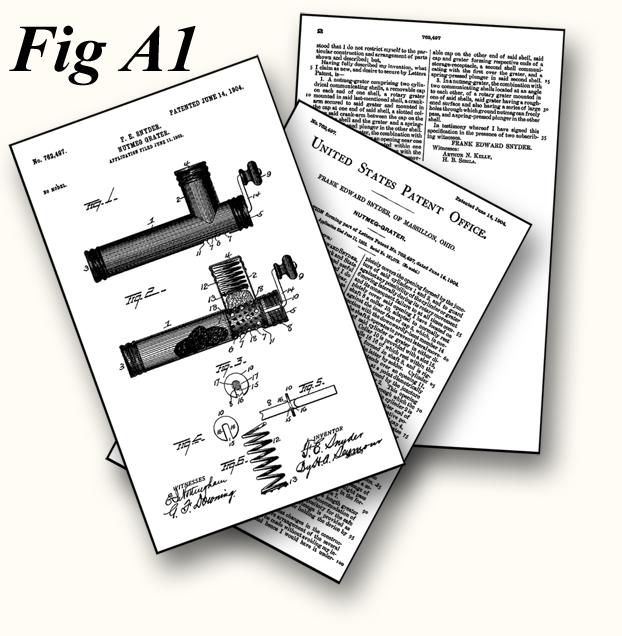 As a new business owner, Edward obtained patents in 1882 for a portable pump and sprinkler and in 1885 for a beer forcing pump. About 1887, Edward purchased his partners interests, becoming the sole owner, before selling the business in 1891 to Jacob Pinkler and Charles Snyder. Edward envisioned a bolder enterprise. As a new venture in Massillon, Edward opened a machine and specialty manufacturing shop on East Charles Street. About 25 years earlier, the bicycle, a novel invention, was introduced into America. At first available only to wealthy men, by the mid 1880's the number of bicycles and riders had exploded ~ it was the golden age for cycling. The high front wheeler was popular and men rode bicycles both as transportation and for pleasure. Edward's new business specialized in bicycle repairs. In addition, he continued to manufacturer his own inventions. 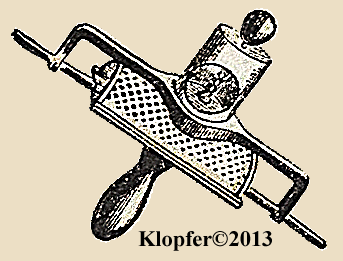 In 1893, Edward began production of the Snyder's Patent Improved Combination Pliers and Hose Wirer which was patented in 1894 [SEE: 1895 Advertisement]. 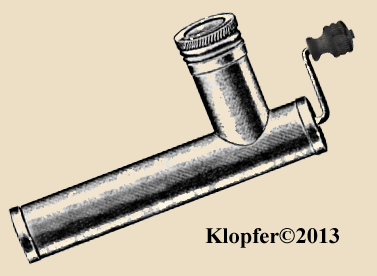 In 1897, his next patented product was the Rain Water Cut-Off which allowed the user to divert rooftop rain water to differing locations "as needed". About 1920, Edward created his most profitable invention, the Snyder's anti-sag screen door brace. It claimed, a few turns on the brace "straightens the screen door to its original position" and "keeps the flies outside the house where they belong." It continued as a "best seller!" until June 1, 1933, when Edward suffered a stroke. Lingering for 50 days, F. Edward Snyder passed away on July 20th, at the age of 80. His businesses were continued by heirs. A Snapshot: Silver & Co., Mfrs. 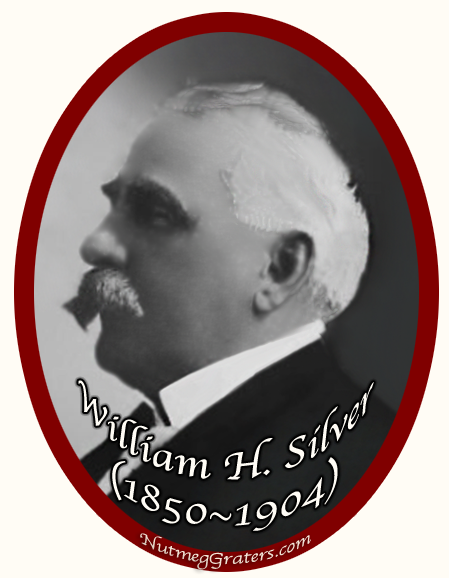 William H. Silver (1850~1904) was born in Milford, Ohio in 1850 and at 19, entered the field of manufacturing. Aged 33, William moves to Manhattan, New York in 1883 to start his business making and selling his first three innovative household devices. Named Silver & Co., in 1886 he relocates the business to Warren Street where he establishes his "manufactory of household inventions". As a small operation, both the sales office and manufactory remained together in Manhattan until 1892, when a larger factory building was created on Hewes Street in Brooklyn, under direction of its new corporate president and long time associate with the firm, John H. Ernst (1853~1915). William Silver dies in 1904. John H. Ernst remains as the president and director of Silver & Co., while also continuing his sole ownership of three bolting cloth and fabric businesses (J.H. Ernst & Co., Kress & Co., the Peerless Towel Supply Company), until his death in 1915. Following this, his wife Mary A. (Heissenbuttel) Ernst becomes president of Silver & Co. with their son John H. Ernst, Jr. becoming vice~president. They continued the expansion of the firm's product-line, advertising "1000 Specialties we manufacture in our large factory." As was common practice, large companies, such as Silver & Co., negotiated various business agreements in order to market their wide ranging products. 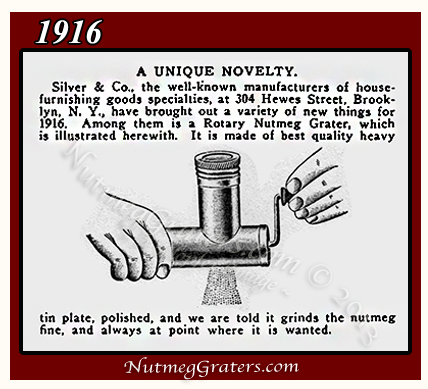 In 1916, Silver & Co., manufacturers of household inventions from Brooklyn, New York, "brought out a variety of new things" featuring the Rotary Nutmeg Grater. [SEE: Article A Unique Novelty, 1916.] Because Snyder's patent of 1904 remained in effect for 17 years (until 1922), Silver & Co. may have fully purchased ownership/ production rights from Snyder, or instead, may have paid him some form of royalty payment. Whatever this agreement, it remains unknown and long forgotten. 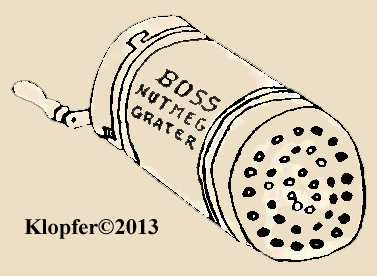 The nutmeg grater model sold by Silver & Co. simplified Snyder's patented design by soldering the two end-caps closed. This eliminated the storage compartment and made the grating cylinder non-removable. These alteration reduced both materials and labor requirements, being less costly to produce. (Fig B) was used from 1916 until 1922. 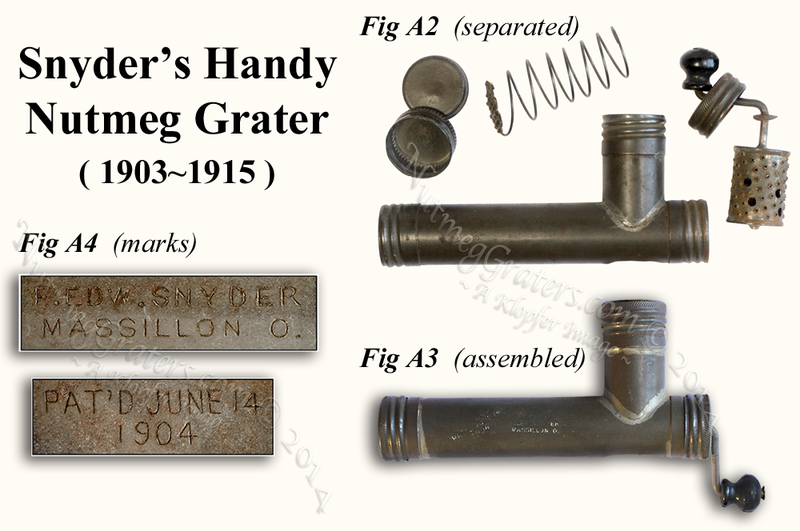 After the time when Snyder's patent expires, the product was renamed Silvers Nutmeg Grater. This title was stamp-embossed across the nutmeg grater's top, also becoming the new trade name seen with its advertisements. 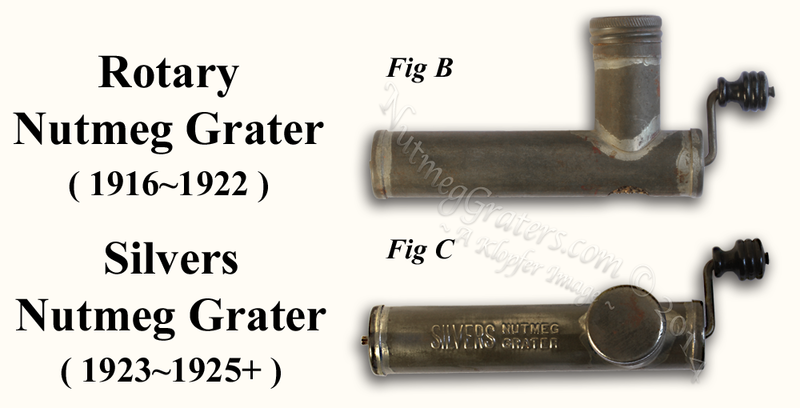 The Silvers Nutmeg Grater was produced from 1923 until circa 1925 (Fig C) when the grater is no longer listed "for sale" among any of the usual housewares buyer's guides or business journals. 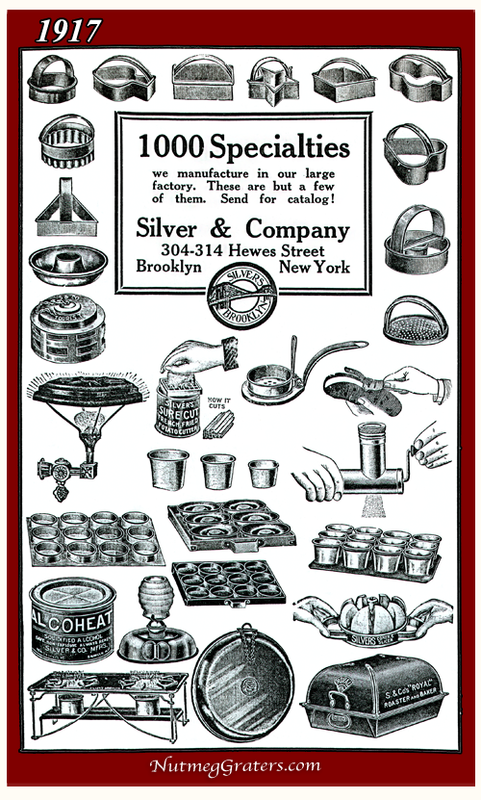 During the summer of 1929, the tin kitchenware giant, Silver & Co., promptly disappears from the Brooklyn City Directories, tax records and all housewares buyer's guides. Its demise is likely the casualty of both the Great Depression that began with the stock market crash during the summer of 1929 and the loss in revenues from the sale of tin items due to the rise in popularity of enamel cooking-wear sold by competitors. 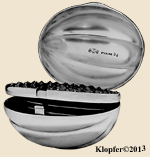 Snyder's Handy Nutmeg Grater, The Rotary Nutmeg Grater and Silvers Nutmeg Graters are findable by modern collector.